Updated at 3 p.m. to reflect Vitter’s comments in an interview with the University of South Florida on Wednesday. Former Ole Miss Chancellor Jeffrey Vitter could become the next president of the University of South Florida following his abrupt resignation from the Lyceum earlier this academic year. Vitter has been selected as one of four finalists for the position of president of USF, according to a press release from the university. The press release indicates that the USF Board of Trustees hopes to select a president from the field of four by Friday afternoon. Vitter will interview with the USF search committee this Wednesday and with other relevant campus groups throughout the week. Vitter resigned from his position as chancellor of the University of Mississippi in November amid public concerns regarding his responses to social media posts from within the Ole Miss community and on the heels of two years of declining enrollment. Les Muma, chair of the USF presidential search committee, declined to comment on whether Vitter’s sudden departure from the University of Mississippi worried the university and the search committee. According to an article published in the Tampa Bay Times, Vitter explained in an interview with the college on Wednesday that he didn’t spend enough time before taking the job at Ole Miss to broaden his leadership team at the university. The other three finalists are Wanda Blanchett, interim provost & executive vice chancellor for academic affairs at Rutgers University-New Brunswick; Steve Currall, provost and vice president for academic affairs at Southern Methodist University and Debasish (Deba) Dutta, distinguished professor of engineering & former chancellor at Rutgers University–New Brunswick. “Each finalist has a broad range of academic leadership experience, including at institutions that belong to the prestigious Association of American Universities (AAU),” the press release read. Vitter, the Mississippi Institutions of Higher Learning and University Communications did not respond to requests for an interview. This is a developing story. Updates will be posted here. Former Ole Miss Chancellor Jeffrey Vitter could be the next president of the University of South Florida following his abrupt resignation from the Lyceum earlier this academic year. 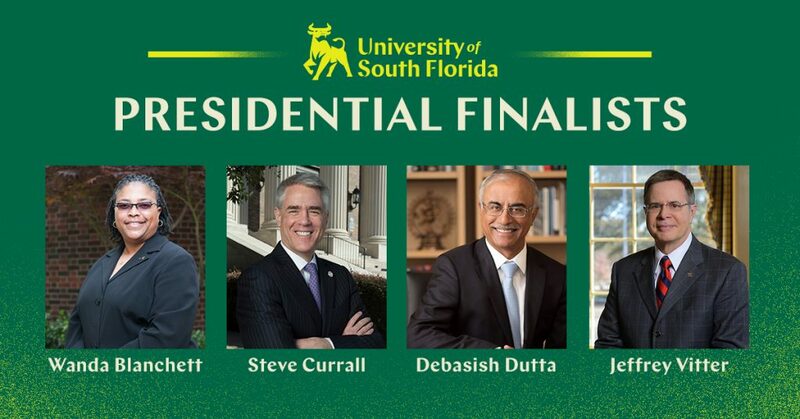 Vitter has been selected as one of four finalists to be president of South Florida, according to a press release from the school. The press release indicates that the South Florida Board of Trutees hopes to select a president from the field of four by Friday afternoon. Vitter will interview with the South Florida search committee this Wednesday and other relevant campus groups throughout the week. Vitter resigned from his position as chancellor of the University of Mississippi in November amid public concerns with his responses to social media posts from within the Ole Miss community and on the heels of two years of declining enrollment. The other three finalists are Wanda Blanchett, Interim Provost & Executive Vice Chancellor for Academic Affairs at Rutgers University-New Brunswick, Steve Currall, the Provost and Vice President for Academic Affairs at Southern Methodist University and Debasish (Deba) Dutta, a Distinguished Professor of Engineering & former Chancellor at Rutgers University–New Brunswick. Vitter served as chancellor as the University of Mississippi from January 2016 until January 2019. He resigned from his position and became the shortest tenured chancellor since the university’s first chancellor resigned in 1849, a year after the university’s founding. Since his resignation, Vitter has continued at the university as a tenured professor in the computer science department. He has been conducting research for the university and has not taught a class in his half-semester as a faculty member. For more Daily Mississippian content, sign up for our newsletter.